Data is growing and so are expectations. You’re being asked to deliver increased capacity without increasing spending. Our experts can orchestrate a solution that maximizes your existing technology and brings the performance you need, within your budget. Get a detailed look at how virtualization, cloud and shadow IT can add major complexities to software licensing. Learn how to keep up with the accelerating pace of change as complexities and security threats continue to increase. See how this year’s ACT-IAC Executive Leadership Conference highlights the importance of transformation, engagement and protection. See why attachments might soon be a thing of the past thanks to seamless and secure cloud solutions from leaders like Adobe. Learn how you can simplify management and improve efficiencies all while meeting increased user demands. Researching Ways to Modernize Your Data Center? Check out the latest headlines from our Solutions blog. See how we helped our customer get their operations up to speed quickly and capitalize on a big opportunity without needing too much capital. Learn all about the sweet solution we built for this confectionery manufacturer to simplify storage and support scalability. We can help you build a future-proofed data center with solutions that include converged infrastructure, flash storage, next-generation networking and virtualization. With the right software as a service and software asset management solutions, you can save money while increasing efficiency. They also give you greater visibility into your network so you can consolidate licenses. Outsourcing the right services can free your IT department to deliver the type of business results the top brass expects. From aggregation, infrastructure and managed services to assessments and workshops, we can help you make the most of your internal resources. 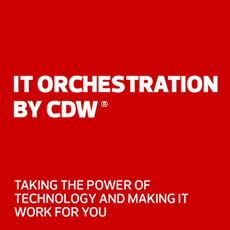 What Else Can IT Orchestration by CDW Do for You?